Salted caramel ice cream with a salted caramel sauce. Organic. With a salted caramel sauce. Made with fresh cream. 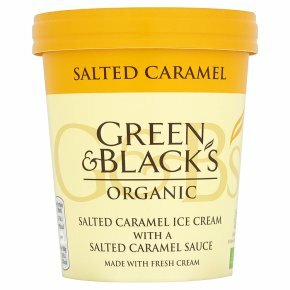 Suitable for vegetarians.Indulgent salted caramel ice cream with a generous swirl of rich salted caramel sauce. Delicate flakes of Anglesey Sea Salt are added to both the ice cream and sauce bringing a delicious balance to the sweetness, bringing out all of the wonderful flavours of this incredibly moreish ice cream.